For competition obedience heeling, you need a dog who is focussed on the handler, close to the left-hand side of the handler and with his withers in line with the handler’s knee. This, however, takes a great deal of concentration and effort from both the dog and handler, and cannot be maintained for very long periods. Loose lead walking is a way of walking out with your dog in a relaxed, comradely fashion – much like strolling through a park holding hands with your best friend. This type of walking can be maintained for long distances without any stress and, for a companion dog is all that is required. But… you have a dog that pulls at the end of the leash as if his life depended on it. 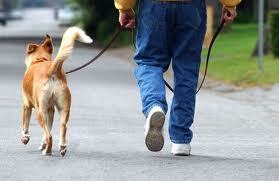 How does that behaviour convert to loose lead walking? The first thing that you must realise is that pulling is a habit – it has been reinforced, possibly for years and is not going to be “cured” overnight. The very first thing you have to commit to, if you’re serious about this exercise, is NEVER, NEVER let your dog pull EVER AGAIN! That’s easier said than done, but if you really want a dog that walks on a loose lead you must persevere. Step 1: I know that this is the most difficult part, but, if you must take your dog for walks, one option is to fit him or her with a head collar (Gentle Leader or Halti). The head collar is a very humane way of stopping the dog from pulling. Most dogs don’t like it in the beginning, but if you desensitize for 15 minutes and only use the collar when going for walks, your dog will soon associate the “nasty” head collar with good stuff, and will willingly put his head through the noose! 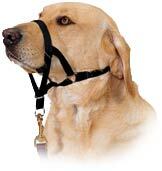 The other option is to get a no-pull harness and use that in the same way as the head collar. Jean Donaldson (author of Culture Clash) demonstrates how to desensitize Buffy to the head collar. Step 2: Meanwhile, at home, you will start working on teaching your dog that having the collar and leash on doesn’t mean he has to pull. Most dogs (and people too) will push against any pressure. If someone pushes against your chest, for example, you will tend to resist; if you try and make your dog sit by pushing against his rump, he will push against your hand and resist sitting. What you are going to do is teach him that giving in to the pressure of the lead is REWARDED! 1. Your dog might resist a little and tighten the leash more. Don’t move, simply sit and wait. At some point he might give in to the pressure, loosening the leash, even just a suggestion of giving will be enough to make you click in the beginning. The moment he does that you will mark that, either with a click or your verbal marker, and give him a treat from the bowl. As soon as he has finished eating, put a little pressure on the leash once more. Again, as soon as he gives in to the pressure, click and treat from the bowl. Continue this way until all 10 treats in the bowl are finished. 2. Your dog might not resist at all and give in to the pressure right away. That’s great, because you can click and treat that giving immediately. Continue as for 1. until you have finished all 10 of your treats. Once you are happy that he understands the concept of giving in to the pressure, you can repeat the exercise in a slightly more distracting environment. You can add movement and changes of direction. 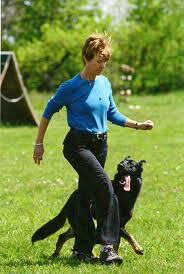 The secret of this exercise is that you are not going to yank on the lead or pull back on it. Your dog has been conditioned to respond to this by pulling harder – so your pressure on the lead will be with the lightest possible touch while still getting through to your dog. I have heard this method referred to as “Silky Lead” and feel that this is a wonderful description. Furthermore, if you have ever watched a really skilled dressage rider control his horse, he also uses really light touches on the reins to control and communicate – no yanking or pulling. I’ve often had people ask me if their dogs are allowed to sniff and explore interesting smells along the way. Of course they may. This is a stroll with a friend, remember. However, I do want the dog to realise that going to sniff a lamppost so that he can catch up on the latest gossip (for example) is contingent on polite behaviour. Suddenly lunging towards the lamppost, taking you completely by surprise is definitely NOT what I would call good polite behaviour. This is a great opportunity to use Premack! Check out my article on how the Premack Principle can be used to get your dog to do what you want so that he can get what he wants!